A few months ago, I jammed about how to reduce the cost of kids. In particular, I jammed about how you can easily have a baby without breaking the bank, with a focus on the first six months of the baby’s life. You can read about it here. That article got a bit of press and was well received. The Baby Bonding Book for Dads reviewed and summarized the original Jam and added some great ideas to mine. 1) Instead of bringing gifts for the newborn baby (like stuffed animals, that your baby doesn’t really need), ask your relatives to bring food for your wife. This will keep her healthy and strong, resulting in a good milk supply for your baby, which is the most important thing you can give it. 2) If your relatives refuse to bring you food, ask them to contribute to a savings fund or bond for your baby, which will help offset some big ticket costs down the road, like university or college. 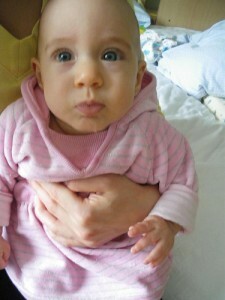 3) Use natural oils for your baby’s skin, such as olive oil, rather than the really expensive fancy oils on the market. 4) If it is not necessary to wash something in warm or hot water, wash it in cold water. This will save on your energy bill. I will add to that and say that you can save a huge chunk on your energy bill by hanging clothes to dry rather than putting them in the dryer. Baby clothes are small enough that they dry quickly when you hang them to dry anyways. If you really want to save money and water, and you need a new washing machine, consider buying a high efficiency one. It costs more than an old-school washing machine, but it will save you lots of money on energy and water in the long run, and you are doing the environment (and therefore, your kids) a huge favour. Remember, we didn’t inherit the earth from our forefathers, we are borrowing it from our children. 5) Save money on crib bedding. Your baby doesn’t need a pillow or a fancy comforter. 6) Do a reality check to make sure you are only buying the things you and your baby really need. You might find that you can cut out the fancy, air-tight diaper disposal bin and just use your regular garbage bin instead. (or laundry bin, if you are interested in saving even more money and are using cloth diapers). Thank-you to the Baby Bonding Book for Dads and the commenters there for spreading the word about this Jam, and adding these additional ideas. Now that Sweet Cheeks is almost six months old, I have started thinking about ways that we can save money in her next six months of life. In terms of what a baby needs, not a lot changes in these six months. Most obviously, your baby will start to consume foods other than just breastmilk, and will have outgrown some of its clothes and toys, but otherwise, her basic needs are still the same. If you didn’t buy a bassinet for your baby, and went straight for a crib (a good way to save money right there), then you can continue using that crib through this phase. Same goes for the stroller and/or sling. 1) Keep the clothing streams coming in. Talk to your friends and people in your neighbourhood. Get to know other families with kids slightly older than yours. They will be happy to give you hand-me-down clothes. Then, when you are done with them, pass them on to the next family in need. 2) Keep using cloth diapers. By the age of six months, the cloth diapers that you bought for your baby may be getting snug. Don’t give up now and switch to disposable diapers. You can buy a set of cloth diapers that will fit your baby from the age of six months right up until the age of two and a half or so. We are using Bamboozles disposable diapers for Sweet Cheeks now, and they are the same Bamboozles diapers that fit Smarty Pants right up until he was potty trained. So we have been getting huge value and use out of them. At six months, you may start supplementing breast feeding with baby food, but it does not mean you need to stop the breast feeding completely. Breast feeding is still an important part of your baby’s diet, and it is still free. So keep it up. 4) Buy second-hand, or go to swapmeets. If you have swapmeets in your area, go to them. They are a great way to get good stuff for your baby, including toys, clothes and other accessories, for really cheap. If you don’t know what a swapmeet is, think of a flea market especially for kids. If you don’t have swapmeets in your area, try some second-hand stores. Baby stuff is just as good used as it is new, because babies outgrow things so quickly and barely use things before they outgrow them. If you are planning on going to a swapmeet, check out my swapmeet survival guide first. Its not rocket science, but it will help you save some cash. Kids don’t have to cost a fortune, and really, if you follow some of these cardinal rules, they won’t. Oh yeah, you’ll still need to buy lots of coffee in these six months… maybe not as much as in the first six months… so don’t throw away that coffee-shop loyalty card just yet! Till next time, keep on jammin!